Who doesn't want to find the cheapest airfare for their next Caribbean cruise or vacation? Ok well if you're lucky and live close enough to cruise ports so that you can drive yourself there, I guess this page is not for you (I so envy you)! I on the other hand, live in Quebec, Canada and we do tend to escape the winters by going South. And unless we're retired and going to Florida for a month, we are at the mercy of airlines. First, here is what I do when I'm looking for a cheap airfare. I go find "aggregator sites"...search engines who do the hard work for you. It's pretty cool actually. See my 'unofficial' survey after the 4 reviews. Yapta is different than the others in the fact that it finds the cheapest airfares, tracks the prices and alerts you when they drop. It's good to use if you're not in a hurry. Once you see what you like you just click on the button to buy the cheapest airfare directly from the airline. Already bought your ticket? They also mention that you could be eligible for a refund. Fly is new and is made available by "TravelZoo". You can search for economy, premium economy, business and first class fares simultaneously. I liked the fact that, once I decided on a fare, it took me directly to Air Canada (the one I chose) to buy and I did not have to reenter my search criterias as on others. I will definitely come back here to book flights in the future. 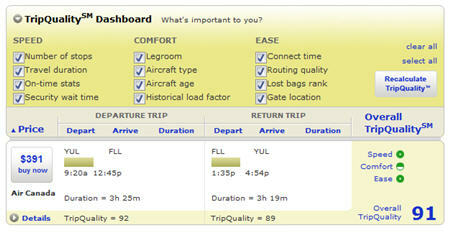 InsideTrip is also new and with an added feature: it will let you evaluate other aspects beside the price. Let's say you're really tall and legroom is very important for your comfort. You include that in your search. There are 11 other items you can check to personalize your search. Inside Trip then rates each search results as you can see on the image above. Cfares - Kayak - could not find non-stop flights! Momondo also had $391US but I didn't like the fact that I had to retype all the search criteria again once on Air Canada. Don't make me do the work twice. I know I'm lazy and I'm too old to change. Next from cheapest airfare let's go find some cheap cruises!